Are you shopping for a Murphy Bed, but don’t know where to start and what to look for? Here is our shopping guide to help you start and answer all your questions along the way. The following tips will make your shopping experience with BredaBeds as smooth as it can be. We suggest you to start with available space you have. Depending on the size of your room you can choose the size of the bed. Lots of people want a larger bed, but they might not have space for it. Eventually you get a crowded looking room and unpleasant results. This leads us to our next topic. BredaBeds offers horizontal and vertical Murphy Beds. At first, it may seem like it is just the matter of personal taste and design, but there is more to it. Thus, a horizontal bed is better for living spaces with lower ceilings and narrower rooms. 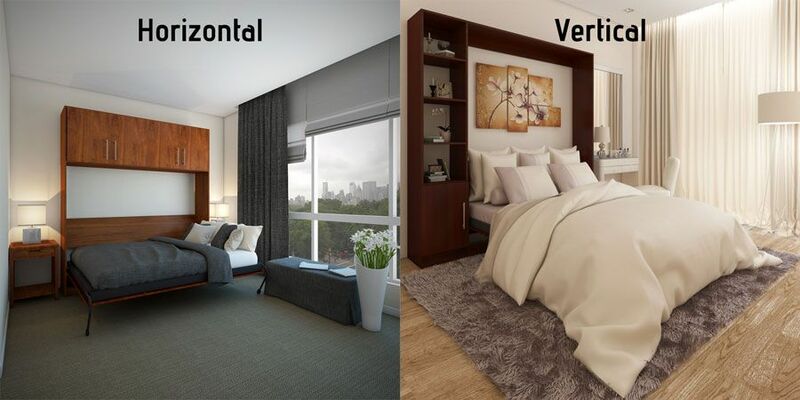 Meanwhile, a vertical bed would be more comfortable for bigger spaces and larger bed sizes with multiple occupants. There are a variety of murphy bed options available, allowing you to customize your Murphy Bed just the way you want it. One available option is a hutch. You can choose one hutch, two hutches, a top hutch (which is available only on horizontal Murphy Bed) or no hutches at all. So, mostly it comes down to your own preferences and space available. Our website presents three elegant collections – Urban, Metropolitan and Penthouse collections. Probably your next question would be how different they are? Mostly it comes down to the door styles and hutch configurations. The Urban collection has a simple door face look and would work great for the modern and contemporary interiors. The Urban bed is only available with open shelving, which means there are no doors on the hutch. So, if you want a simple and clean look then an Urban bed is your perfect bed! The Metropolitan collection has raised panel door faces, which may look nice with traditional styles. It has drawers, pull-out night shelves and hutch doors available. If you prefer more of an extravagant look, then the Metropolitan model would work great for you. The Penthouse is our designer collection that gears towards a more contemporary style. It has faux drawers on the bed face panels, which creates a modern and intricate look. Penthouse beds, just like the Metropolitan Murphy Beds have hutch doors available, but in addition it has a “hidden pull-out night shelf” and its hutches are extra deep for hanging clothes, which can be used as a mini closet. What can be cozier than to have a warm robe right by your bed, when you wake up in one of those chilly winter mornings? BredaBeds offers a variety of different colors for different tastes, so you have a great selection and can find the best color just for your room. 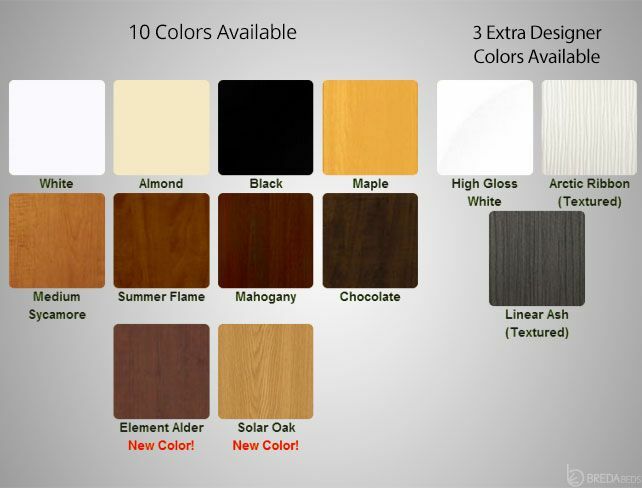 Just recently we have added two new colors – Element Alder and Solar Oak. Thereby, we offer 10 colors for our Urban and Metropolitan collections and 13 colors for the Penthouse collection. We are all familiar with difficulties choosing the color that we want online, due to different brightness and contrast on each computer screen. That is the main reason why the same color may look absolutely different from the actual bed color. We are trying to make our clients’ shopping experience as comfortable as we can, so we came up with a new feature, where you only need to fill out a sample request form and we will send it to you, typically, the next business day. Thus, you can choose your bed color with confidence and avoid an unpleasant surprise. BredaBeds wants to make sure that you are happy with your shopping experience on our website and your BredaBeds purchase. This section refers to the color of the bed handles and optional drawer/cabinet pulls. 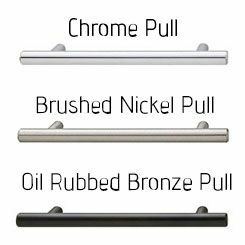 We offer 3 finishes – Chrome, Brushed Nickel and Black. All the colors are listed from the lightest to the darkest shade. We give that option, so that you can try to match your existing furniture and some hardware finishes you may already have. Also, some finishes work better with certain colors and it helps to complete the look of your room. By now, you should have made all the right decisions on your perfect Murphy Bed, which you can fully enjoy and can get the desired look for your room.